Ted Nixon illustrates the values of high school athletics even years ago when the “high school dropout” was the rule rather than the exception. Ted quit Alliance High School in 1921 to become a plumber’s apprentice. When his brother George started playing football, Ted was encouraged to return to school and take up the sport. A two year performer in both football and basketball, he experienced frustration and success. He captained the hard-luck 1923 football team that was 2-6-1; he was a member of the 1922-23 basketball team that reached the state semi-finals. In addition to the lessons of life, football meant a high school education and full scholarships to West Virginia University for the Nixon brothers, after a year at Bellefonte Academy, PA, were Ted played guard. 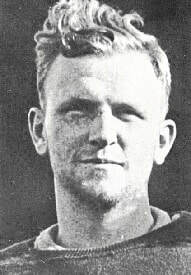 Ted, whose full name was Thomas D. Nixon, captained the freshman grid team at West Virginia and played three varsity seasons at guard for coaches Doc Spears and I. E. Rogers. He wrestled in the 175-pound division. Graduating with a Bachelor of Science degree, he taught industrial arts at Grafton, West Virginia from 1928 to 1933 and was engaged in private business in Morgantown W. VA. from 1933 until his death in 1960.